Viewers choose how they want to watch programs — watch ad-supported content for free, rent content for a nominal fee, or buy to own. The days of expensive cable TV and monthly bills may be numbered. A small startup company, ZillionTV, is testing a new Hulu-like set-top box that allows users to stream their favorite shows direct to their TV minus the complicated computer. Instead, users attach a small WiFi-enabled box and using a motion-sensing remote, they can surf through a menu of choices from TV shows, movies, and music. Disney, NBC, Universal, Sony Pictures Television, and Warner Bros. are said to be content partners which means loads of popular content will likely be available (no word on specific titles yet). Viewers choose how they want to watch programs — watch ad-supported content for free, rent content “for a nominal fee, or buy to own.” For example, television content from NBC Universal will be available via “buy to own”. The device supports standard definition as well as HD up to 1080p. Cable and satellite companies may want to sit down and grab some smelling salts for this part: ZillionTV is subscription-free so there’s no monthly bill. Users pay a one-time activation fee and receive the hardware as part of the package. Revenue is generated through targeted advertising, pay-per-program fees and television commerce. Zillion tracks consumer behaviors and preferences and is able to market that to advertisers with advanced, aggregated viewer data on who's watching and when. 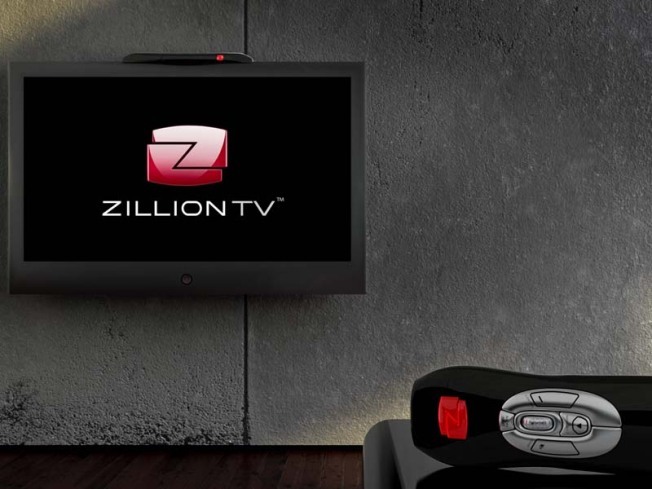 If it’s successful, ZillionTV could change the way many consumers get their content. The service is being field tested in select markets and is expected to be available nation wide by the end of the year.